Until very recently, when the Dominican Republic came up, I thought of beautiful beaches, baseball, and bachata. Now I think of Mangu. Popular in most Caribbean cuisines, this mashed plantain side is a staple of the island’s diet. And it makes a great meal – especially breakfast – when served with eggs, onions, cheese, and sausage. Here’s how Dominican émigré and Allston business owner Gloria Rivera makes it, and why. Reader, be warned: if by the time you finish reading this you think I’ve glorified Gloria, you’re right – and you will also understand why. Gloria moved to Allston from her hometown of Bani more than 20 years ago. Like so many immigrants, she arrived with many dreams, zero English, and relied on an acquaintance to show her the ways of the new country. 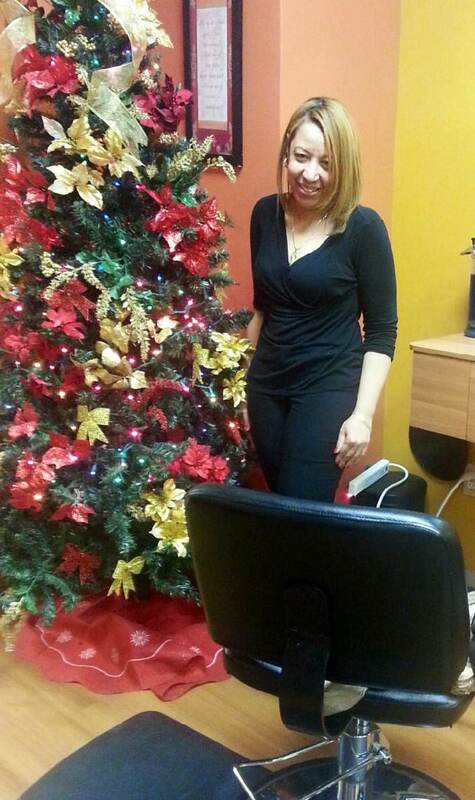 She worked as a waitress, first at Mirage (now Coco’s Bar) and then at Merengue, a Dominican restaurant in Roxbury. By the way, check out Merengue; it’s fun and delicious. She had run a beauty parlor out of her home in Bani. Now she dreamed of opening a salon in Boston. If you met Gloria, you’d understand it was only a matter of (little) time until her dream became a reality: she’s extremely hardworking, energetic, and optimistic. But she needed to get a few things in order first: learn English, get a degree and a license in cosmetology, and save money, lots of money. She waited tables a few nights a week while taking English classes at the Jackson Mann Community Center adult literacy program in Allston. She also worked as a sales representative for a cosmetics company, which supplied products to salons around the city. This helped Gloria learn the ropes. She did all of this while raising three children with her husband. Oh, and she also found time to volunteer her time for causes related to teen pregnancy, tobacco use, HIV and domestic violence prevention at a number of local organizations, including the Boston Public Health Commission, ABCD, City Life, etc. She then enrolled in beauty school. But the head teacher doubted Gloria’s English was good enough get through the program, so she offered her to attend a few classes until the first quiz, which, if she passed, she’d be formally admitted into the program. Gloria applied herself. And she passed. After the yearlong program and a degree in cosmetology, Gloria opened her salon in 2007: Gloria’s Beauty Center on North Beacon Street (across from the Jackson Mann Community Center). She started out small and, like so many entrepreneurs, funded it all with personal savings and credit cards. Today, Gloria employs 12 people. Despite the demands of being a business owner and still having two teenagers at home, Gloria still finds time to volunteer. She supports FUNDOARCU, a Boston-based, Dominican-focused organization where she teaches citizenship classes and helps organize cultural events. As our conversation came to an end, the salon already empty at the end of a long day, her cell phone rang. It was one of her sons who had just finished at the gym and wanted a ride home. She said she would pick him up, but first she had to stop by the supermarket to get a few things for dinner. Here’s her recipe and the Dominican flag – included at Gloria’s request. Peel the plantains, cut them into chunks, and boil in water (no salt) until soft (approximately 20 minutes). Drain most of the water (but leave some in the pan) and mash the plantains until soft. To prevent the mashed plantains from hardening, add some cold water. Add butter, salt, and olive oil to taste. I use about 1 tablespoon of butter and 1 tablespoon of oil per plantain. Serve for breakfast with sautéed onions, pan seared fresh cheese and seared salame, and eggs cooked to your liking. Tip: peeling plantains can be tricky. Soak them in warm water for a few minutes to loosen the skin, then cut both ends, make a few slits lengthwise with a knife, and peel with your hands. Or watch this video. 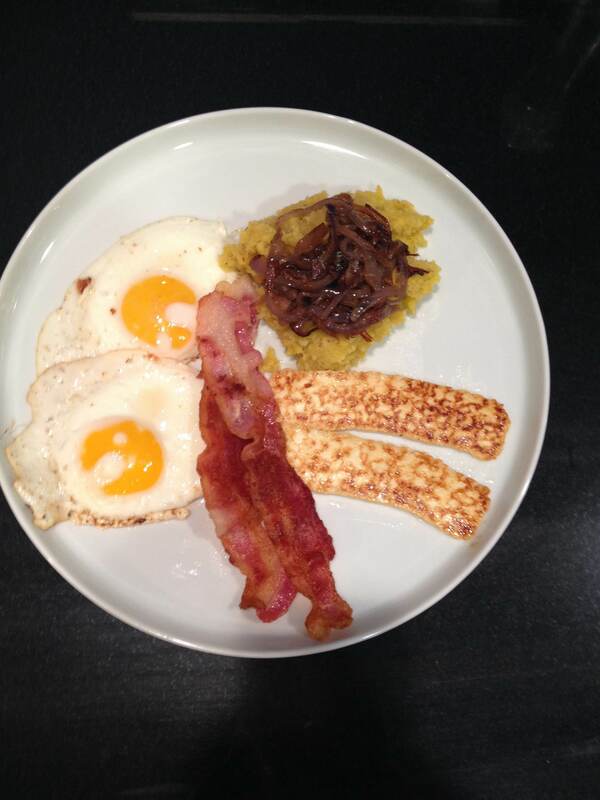 Add a little lime to fried onions and throw that on top the mangu! Mmmmmium! Please do! The more shares, the more love.